RIVERSIDE, Calif. (http://www.ucr.edu) — A new study led by University of California, Riverside astronomers casts light on how young, hot stars ionize oxygen in the early universe and the effects on the evolution of galaxies through time. In other words, the universe is in a production crisis as galaxies are becoming less active in creating new stars. 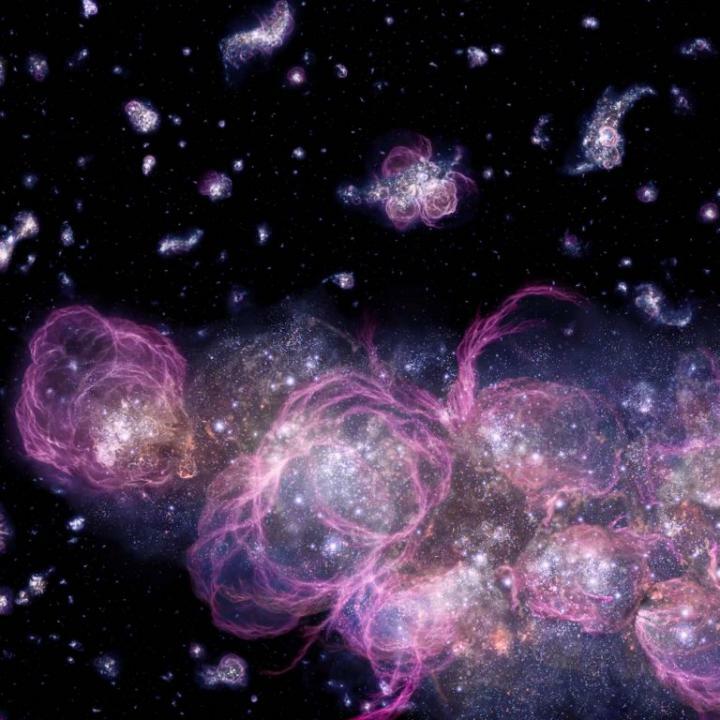 Because cold gas is the fuel of star formation, it is imperative to understand how the physical conditions of the gas are changing throughout the universe's history. "One way to study the conditions of gas in star-forming regions of galaxies is to observe the spectral emission lines," said Ali Ahmad Khostovan, lead author of the paper and a graduate student in the Department of Physics and Astronomy at UC Riverside. "These lines are produced when light from bright, massive, short-lived stars interact with the surrounding medium resulting in regions where atoms are broken up or ionized." This is accomplished because of the unique design of HiZELS. The survey uses four narrowband filters, one installed on the Subaru Telescope in Hawaii and the other three on the United Kingdom InfraRed Telescope (UKIRT), also in Hawaii. These filters are narrow enough that the light from an emission line would dominate the detector of the telescope. As emission lines are narrow and redshifted, they act as testifiers of four different time slices (one for each filter) of the universe's history. The paper, "The Nature of Hβ +[OIII] and [OII] emitters to z ? 5 with HiZELS: stellar mass functions and the evolution of EWs," was coauthored by David Sobral (Lancaster University in the United Kingdom), Bahram Mobasher (UC Riverside), Ian Smail (Durham University in the United Kingdom), Behnam Darvish (Caltech), Hooshang Nayyeri (UC Irvine), Shoubaneh Hemmati (Caltech), and John Stott (Oxford University in the United Kingdom).